Sturdy blanchard steel frame with convenient adjustable daylight and large aluminum work table for easy mounting of tooling. Motor driven – timer controlled foil index system for precise advance of foil. Operator friendly touch screen controls with totalizer counter – setup button and head up delay. Ten recipe storage for timer values – air pressure and temperature settings. 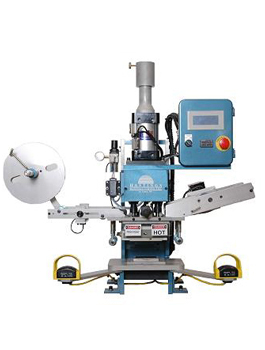 Rugged frame design allows this press to be used as a bench top press or integrated into an automatic system. The convenient adjustable daylight and large aluminum work table make setup of new projects effortless. Top quality components are utilized throughout the manufacturing of Hastings products. Electrical – mechanical and pneumatic components are always standard off-the-shelf components that are readily available. All machine components are painted – zinc plated or hard anodized for lasting protection.